The revitalized Adelphi Hotel in Saratoga Springs, New York, delivers a modern and luxurious sensibility that embodies first class services of a grand hotel. The 150-year-old historic boutique hotel has been reimagined for the millennium to personify a modern twist, and eclectic revival of timeless ideals. The Adelphi partnered with Electrolux Professional and are now utilizing the air-o-system cook chill package to streamline their kitchen to support 3 restaurants, banqueting and in-room dining. Installed equipment includes air-o-steam Touchline combi ovens, air-o-chill blast chiller/shock freezer, 3 thermaline pressure braising pans, EMPower ranges, Bermixer immersion blenders and TRK combination vegetable cutter/food processors. Of particular note, The Blue Hen restaurant will utilize the new equipment to offer an unmistakably refined dining experience providing warm hospitality and classic fine dining. J. Wilson Marketing managed the equipment installation at The Adelphi Hotel. J. Wilson Marketing is the Electrolux Professional territory sales representative group covering the upstate New York and western Pennsylvania area. Queen City Catering opened in December 2010 with four full-time employees. Since then, innovative owner Andrew Matroni has expanded the company to more than 40 full-time employees and a 10,000 sq. ft. custom-built catering headquarters in the heart of Charlotte, NC. The HQ includes two tasting rooms with custom built live-edge wood tables, state of the art technology and smart building wiring, more than 700 sq. ft. of walk-in refrigeration space, 33 ft. of continuous stainless steel hood, 10 commercial ovens, 3 combi steamers, 90 ft. of stainless prep table, 25 ft. high warehouse with high density shelving, and 30+ collaborative work spaces. The newest addition to the equipment line-up is the powerful Electrolux air-o-steam Touchline combi oven stacked on another air-o-steam Touchline for increased kitchen production capabilities. Perfect for delicate seafood and pastry items as well as sous vide cooking and being an overall kitchen workhorse for all menu items, the secret is in the patented Lambda sensor inside these combi ovens. The Lambda sensor monitors the steam and temperature to the exact degree – so the chef doesn’t have to worry about serving an inferior food product. Team Blue used Electrolux Professional equipment while Team Red used competitor equipment to execute a 4-course plated dinner for 200 invited guests. The results of the experiment may surprise you. Typically, negative stress is the accepted norm in professional kitchens and the industry suffers as a result. The campaign for Championing the Changed Kitchen follows each chef in this social experiment with a closer look at how they manage stress while working in a busy kitchen. This campaign presents videos, released weekly, of the chefs as they share their personal stories on their profession. The last of the chef videos will be posted Oct. 4. See more of the interviews. Executive Corporate Chef Corey Siegel developed a variety of innovative vegetarian recipes using Electrolux Professional food service equipment. 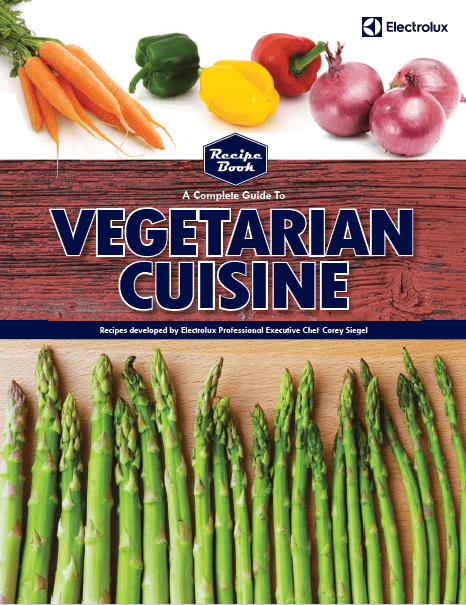 “A Complete Guide to Vegetarian Cuisine” is now available for free featuring chana masala, smoked eggplant dip and zucchini, corn and potato cakes.